– All Machines have been redesigned from the ground up, less polygons meaning a 25FPS+ Boost to performance. – All Machines Cleared memory leaks and callstacks from scripting, also gives huge performance boost. – All Machines have New realistic sound effects for tracks, rollers, engines, cutters, ect. – All Machines spawn with proper spacing so they don’t land on top of each other. – All Machines Lights and Exhausts have all been fixed so nothing is offset or blocked. – All Machines heads spawn facing upright in proper positions instead of stuck down into the ground. – All Machines Sensitivity of all controls adjusted for better movement. – All Machines Tracks have been re positioned for better look. – All grapples and claws have been rebuilt and some are using new models that look fantastic. – All grapples now have better physics performance for grabbing trees on the V2 Maps. – All grapples have changes collisions for smoother more accurate grabs. – Dangle grapples have been fixed so that they move slower and don’t jerk around and get stuck in the air. – All Bunchers now have blades attached to machines so no need to purchase a “Buncher Blade” just turn the head on and cut. – All Bunchers have new cut nodes and redone claws for very low cuts and very easy tree collection without glitches. – New Machine “Grapple Saw Loader” has saw on grapple that can be turned on and off and lowered to cut trees. – New Machine “Chipper” Used for cutting up bits left on the ground, just clears them doesn’t turn them to chips. – Processor has new model for the head, Proper rollers that turn and new claws for picking up more accurately. – Processor head has been completely re-scripted for proper grabs and better control of cutting. 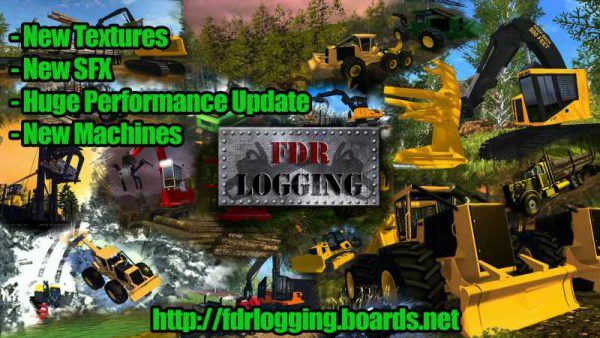 – Log trailers have had collision updates, new tires and better handling, also fixed trees sliding off when too full. – Self Loader has been redone new grapple, added light to boom, fixed sliding when loaded to one side. – Crane Loader has new claw an weights for picking up entire truck loads of wood without a problem.